It was precisely September 18th 1979, in Linz that Hannes Leopoldseder, Hubert Bognermayr, Herbert Werner Franke and Ulrich Rützel initiated the first Ars Electronica festival. But who at the time would have thought that an event articulated right from its beginnings around art, technology and society would be so enduring? Christine Schöpf and Gerfried Stocker have taken on the artistic direction again this year. Cartographers, from time immemorial, have strived to represent the world and one has to admit that the photograph entitled “The Blue Marble”, a satellite image of the Earth dating from 1972, has greatly contributed to understanding its fragility. Then Google arrived and exposed its every nook and cranny. The exhibition “The Big Picture” at the Brucknerhaus is an assemblage of multiple representations of the world. 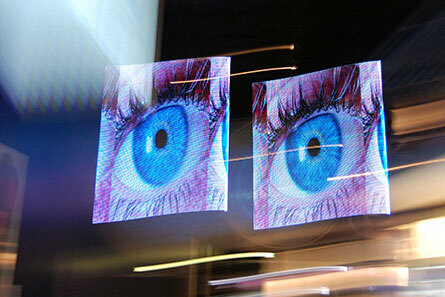 There are, for example, two large screens connected to the site “visualizing.org”. 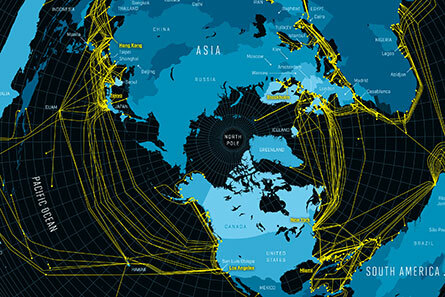 By looking at the map entitled “Map of the Internet Submarine Cables” designed by Nicolas Rapp, we discover that cloud computing is nothing more than a marketing invention because the emails that we send to correspondents on other continents use cables that humans have patiently laid along the ocean’s floors. The cable route between the Eastern United States and Europe seem to be the most “congested”. The network of networks thus appears to be a lot less immaterial than one might imagine with these huge energy consuming data centres that a web of cables links one to another. “Desire of Codes” is a series of installations by Seiko Mikami that one can see and see again as they evolve so much while being exhibited. This time it is at Lentos that these mechanical arms are being exhibited, spying at us through their lenses. Those in the first room, numbering six, move around with suppleness in the silence, or almost, to then flee when they are observed. We are always in the line of sight of one of them, as though placed under constant surveillance, but without ever knowing under which angle. The fluidity of the machine’s movements, like a gentle threat, draw our attention while our images on the floor, appear and disappear, from one camera to the next. But there are other articulated arms awaiting us in an adjoining room. They become active also as soon as they see us, but they are smaller, more numerous, noisier too and only work in fits and starts. Here it is by their number that the work seems a little menacing, when it follows us with all of its robotised arms. A circular fragmented screen increases the insect quality of this second machine that ceaselessly observes us while surreptitiously posting video sequences that are like imagistic proofs of its extreme vigilance. 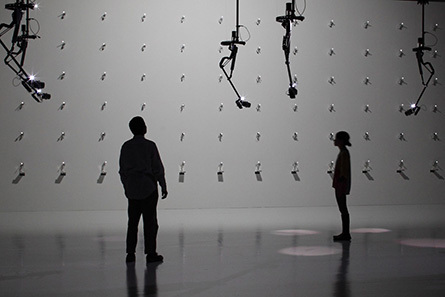 Ars Electronica is also a centre that seems a bit like a science museum where art sometimes blends with innovation. And it is down below, right at the bottom that a label, which is apparently without a corresponding work, draws our attention. We then continue our visit between mediators and technological objects when suddenly we feel we’re being observed. Somewhere here, there is a look, an eye spying on us, surveying us, once again. But it only appears furtively in spaces swept by momentarily abandoned looks. Reading the label we learn that this work, extirpated from the invisible, entitled “saccade-based display” and created by Junji Watanabe, Hideyuki Ando, Tetsutoshi Tabata and Mariana Verdaasdonk, informs us that it involves the digital control of electroluminescent diodes right down to the millisecond. Retinal persistence does the rest. The furtive apparition of this eye that is spying on us might be considered to be the consequence of an involuntary collaboration between the apparatus of the work and the spectator’s body. Might not this pupil that literally unfolds in space be the perfect metaphor for a society under surveillance that George Orwell warned us about? Every year, the University of Art and Design in Linz welcomes creations from student artists from another school. This year, it is the Berlin University of the Arts that is being honoured and the level is excellent. 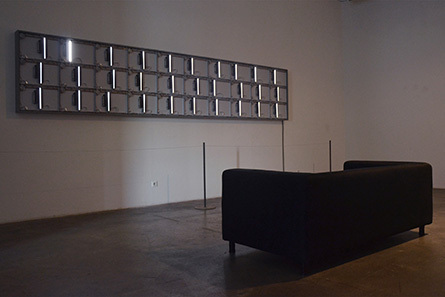 Among other things, we discover the installation “Digi.flat 90-12” by the Berlin collective Korinsky. This involves an assemblage of flat scanners turned towards the spectators. Slowly, they scan the exhibition space. This luminous work that incites contemplation is also interesting because it makes use of machines that are gradually fading away. What can now be digitalised in a world where everything is digital? Flat scanners, which yesterday symbolised access to the digital world, today only evoke the past of analogous electronic documents. These technological objects of a past revolution diverted by artists of the digital generation thus find again a use through the slow acquisition of a piece of the world. It is at the Offenes Kulturhaus that one can find the “CyberArt” exhibition devoted to works awarded with distinctions ranging, in eight categories, from the highly sought after Golden Nica to honourable mentions. But the museum entrance is partially obstructed by the installation of another event: “Sinnesrausch”. 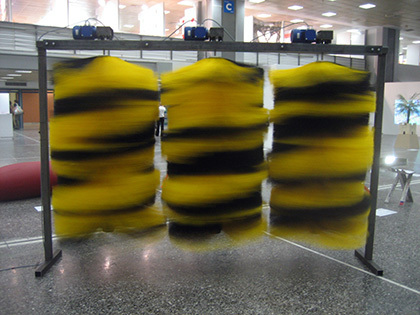 Two bushy yellow rolls streaked with black resembling those we see in automatic car washes await the public. When they spin, whirling with speed, they are even more beautiful. Who hasn’t wanted to stay in the car as a child, engulfed by the flux of saturated, wet colours? This gateway, conceived by the artist David Moises and entitled “Touch of the Tiger” – even though there is neither soap nor water at the entrance to the museum – continues to indicate to us the limit between a before and an after, between one space and another; a kind of obligatory passage with the appearance of an initiation rite. Because, ought we not in fact separate ourselves from any prejudice or preconceived ideas before entering into a place devoted to art? We are now at the CyberArt exhibition, under the lumino-kinetic installation “Versuch unter Kreisen” by Julius von Bismarck. This is the artistic result of a residency spent at CERN, where particles circulate on rings at great speed. 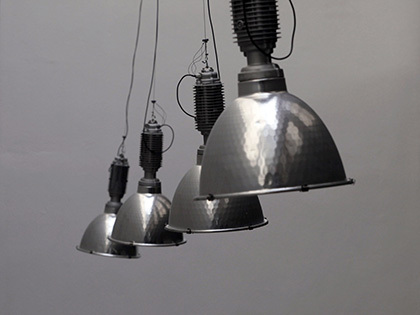 The four lamps that are suspended from the ceiling also describe circles, but at varying speeds. Starting from there, every imaginable choreography is possible as well as every interpretation. The lamps describe figures that imperceptible transitions trigger one to the other. According to the artist, it’s only a question of mathematics here, though one asks oneself which one of the four incandescent lamps directs the others. And just as quick as they come into alignment as though linked by invisible ties, there is one that seems to accelerate while another can’t manage to keep up with the group. You can watch them for hours on end, hypnotised by the aesthetic beauty of physical laws. The artist, Julius von Bismarck, when receiving his prize admitted to having learned a lot at the CERN. It is likely that the scientists were also marked by his presence. At Ars Electronica, there are generally works that are presented while others are only documented. In the case of Agnes Meyer-Brandis, it is indeed the documentation that makes the work. “The Moon Goose Analogue” is only the poetic research stage built upon residences and exhibitions. To begin with, there is a book that was written in 1602 par Francis Godwin: “The Man in the Moone” that describes Domingo Gonsales’ journey to the Moon, drawn by a flock of geese! But it is also the first text that mentions weightlessness. 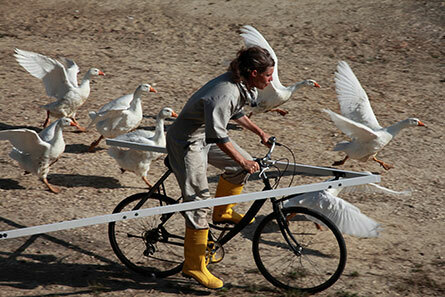 The German artist decided to raise “lunar geese”, making sure that they would memorise her face as soon as they hatched. Agnes Meyer-Brandis has given them all the names of astronauts before preparing them to repeat the exploit achieved by those lead by Domingo Gonsales on the Moon. The confrontation between art and science in this project is perfectly orchestrated, right down to the gray colour of the lunar surface, recreated for the occasion and without forgetting the control room connected to the geese. Science here is at the service of the imagination, which always precedes it. There are artists who have never quite grown up. 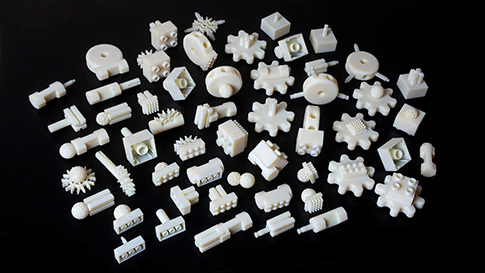 The collaborative project “Free Universal Construction Kit” is one example. Initiated by Golan Levin and Shawn Sims after having noted the incompatibility between the various pieces coming from the many models of construction games, they have now made it possible to freely download three-dimensional models for 80 adapters designed to connect the bricks of different brands ranging from Lego to Tinkertoys and on to Duplo. 3D printers are becoming more democratic. We are gradually seeing appear within small manufacturing laboratories the culture of Open Source technologies being associated with the practice of Free Art. The “Free Universal Construction Kit” is therefore much more political than it seems when it incites us, not to refuse standards any longer, but to imagine possible connections that allow us to create by operating through hybridisation. And it is perhaps the hybridisation of approaches, at the crossroads of art, technology and society that assures the longevity of the Ars Electronica festival itself. Written by Dominique Moulon for Digitalarti and translated by Geoffrey Finch, October 2012.